Before Michael Brown’s bullet riddled body had even been consigned to the ground, disciples of America’s miraculous self-healing powers were proclaiming that “change” was already in motion. Liberal punditry, whose ranks always swell when Blacks threaten to abandon the American shipwreck of dreams (and then shrivel back into inconsequentiality once the danger of rebellion has passed), are busily finding reasons to believe that the crisis can be averted through minor retuning of the policing apparatus. Salon magazine heralds the philanthropic gift of 50 body-cameras to the Ferguson police as the “first sign of change”  – as if the addition of video equipment alters the fundamental nature of the armed occupation of Black America. Politico is euphoric that President Obama, whose administration has surpassed all its predecessors in militarizing not only local and state police, but the entire federal government, has announced a “review” of its policies. The fact is, the Ferguson police didn’t just “look like” they were preparing for war with Blacks, they have been actively engaged in a war of occupation against Black people, as have their counterparts across the width and breadth of the nation, since long before they were gifted with layers of combat gear. The usual Black preacher-politician first-responders to threats to domestic order hector that the cures to what ails Ferguson are readily at hand: the Gospel and the vote. But liberation theology has given way to “prosperity”-hustling and psalm-flavored ghetto pacification, while electoral politics, as prescribed by the Black Misleadership Class, is a euphemism for induction into the Democratic Party, which has encaged Black politics for roughly the same period as the Mass Black Incarceration State has encaged Black bodies in the world’s largest gulag. Apologists for the Black Mass Incarceration State emphasize the particularity of Black Ferguson’s predicament – that it is a two-thirds Black town with an overwhelmingly white municipal government and police force. However, the overarching significance of Michael Brown’s extrajudicial murder is that it is emblematic of the general Black condition in the United States. 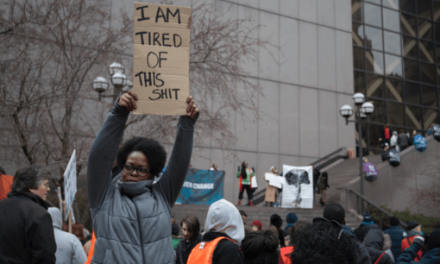 The antidote offered for Ferguson’s racial malady – more Black elected officials and cops – has already been administered in towns and cities across the land, including St. Louis, of which Ferguson is a Black push-out/spill-over. St. Louis, which was until recently a Black majority city, has had a Black mayor (Freeman Bosley, Jr., 1993-97) and a Black police chief (Daniel Isom II, 2008-13). Chief Isom so impressed the powers-that-be, he was given a cabinet-level post in the administration of Gov. Jay Nixon, who imposed the curfew in Ferguson, brought in the National Guard, and last week named Isom as the state’s public safety director , in charge of the state police and the National Guard. Isom can be expected to work the same miracle in state law enforcement as he did in St. Louis where, just ten days after Michael Brown was slaughtered, police cut down 25-year-old Kajieme Powell  in a volley of 12 gunshots while in no danger to themselves and just 20 seconds after eyeballing Powell on the street. When word of Powell’s killing reached protesters in Ferguson, said Erica Totten , an activist who had journeyed from Washington, DC, “it was a spirit-crusher. We are here protesting the killing of a young Black person – and they kill another one right down the street. It broke people’s spirits.” If all that Ferguson has to look forward to is a future under a local government-police regime like that achieved by St. Louis, Newark, New Orleans, Philadelphia, Atlanta and other current or formerly Black-led cities with large numbers of Black police officers, then there will be an endless succession of dead young bodies at high noon on its streets. Black elected officials and Black cops do not change the essential nature of the Black Mass Incarceration State. Rather, the history of the past four decades has shown that nominal Black rule tends to obscure and legitimize the armed, predatory occupation. Electoral politics can be theoretically useful if it seeks to form local governments whose avowed mission is to sever all connections to the Mass Incarceration State – to create governments whose promise to the people is to cease cooperating with the machinery that enforces what Michelle Alexander calls the New Jim Crow. Governments that are worthy of Black people, and their vote, would not only refuse infusions of military equipment and training; they would resist by all means possible every systematic county, state and federal manifestation of the Mass Incarceration State. If, as we at Black Agenda Report maintain, mass Black incarceration and raging gentrification are the greatest challenges facing Black America, then Black political movements – including electoral politics – must have as their central goals the dismantling of the Mass Black Incarceration State and defense of our people against geographical and jurisdictional dispersal, the twin scourges that negate all our other efforts towards self-determination and material progress. The only argument should be: How do we get there?